It’s impossible to put together a list of the best boutique accommodations in Hong Kong without including The Upper House, the intimate luxury hotel perched high above Pacific Place. Sophisticated and sleek, The Upper House combines urban-chic with a cosy, residential feel that’s become a trademark of Swire Hotels’ The House Collective, a group of tasteful, highly refined hotels which includes Hong Kong’s The Upper House, The Opposite House in Beijing and The Temple House in Chengdu. These properties are some of the most coveted stays in their respective cities; this year, they’ll be joined by the Shanghai property, The Middle House. The Middle House is the fourth property in The House Collective from Swire Properties. Officially welcoming its first guests in April 2018, The Middle House represents a departure from the crop of big-name brands that have settled down in China’s bustling modern metropolis in recent years, providing instead a tranquil and intimate retreat in the city of over 24 million people. Offering 111 rooms as well as 102 serviced apartments across two towers, The Middle House is nestled in Jing’an along Nanjing Xi Lu, one of the city’s biggest shopping and commercial districts. 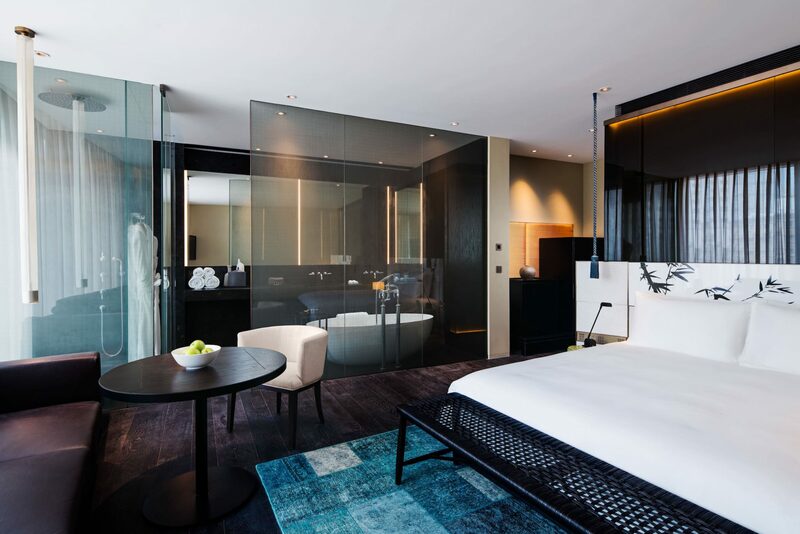 The “middle” in the name refers to the hotel’s central location, and continues the theme of The Hotel Collective, with the Shanghai property drawing on a common philosophy and design aspects from its Beijing, Chengdu and Hong Kong counterparts. The Middle House embraces intimate luxury. 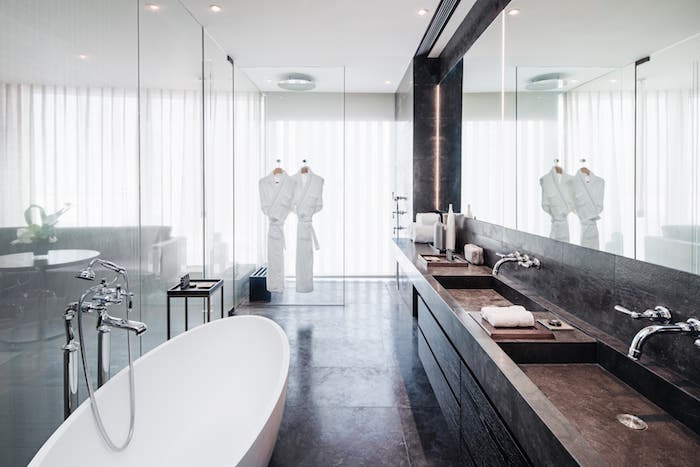 The beautiful space is rooted in a blend of contemporary elements with local Shanghainese aspects, a marriage of old and new brought to life by renowned Milan-based architect, Piero Lissoni. Taking inspiration from Shanghai’s rich heritage of art, culture and craftsmanship, Lissoni has applied his signature modernist aesthetic, combining minimalist elements with ‘old Shanghai’ aspects from the rich colour palette to the traditional Chinese-style furniture. The striking design is most evident in the façade, which features a series of aluminum louvers (an element of old Shanghainese architecture rounded for a modern twist), providing a multi-textured feel and doubling as an extra layer of privacy for guest rooms. Rooms feature ornate detailing and pops of turquoise and orange. Inside, guest rooms are outfitted with contemporary Italian furniture, with Chinese influences seen in the oriental-style nightstands, backlit walls and striking Chinese artwork. Large-panelled windows look out on the bustling cityscape, with transparent room dividers and glazed screens used to brighten each room and create a sense of spaciousness. For the residences, sliding wood panels have been used to provide a flexible living space, where guests can choose from an open layout with adjoining rooms, or closed panels for more privacy. Residences at The Middle House. Like The Upper House, The Middle House will evoke its natural surroundings with a warm colour palette of white and cream accented by brushed bamboo textures. Meanwhile, bright pops of colour in the furniture and artwork bring a touch of character and root the hotel in the vibrant surrounds of its city, creating an intimate yet approachable home away from home for business and leisure travellers. As for amenities, The Middle House will feature swimming pools, tranquil outdoor spaces and gardens, a bar, world-class spa, and an outpost of Café Gray Deluxe, the modern dining concept helmed by New York-based chef Gray Kunz, which made its debut in Hong Kong’s The Upper House. For discerning travellers seeking originality and intimate luxury on their next trip to Shanghai, a stay at The Middle House is sure to be at the top of their list.